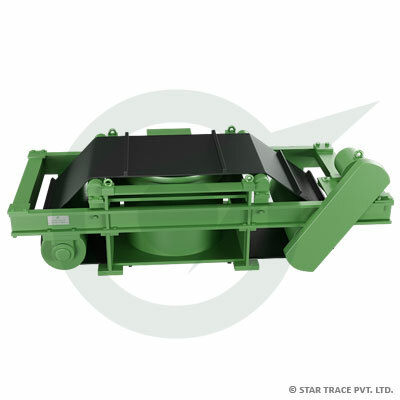 Overband Electro Magnetic Separator | Coal Processing | Star Trace Pvt. Ltd.
STAR TRACE Overband electro magnetic consist of an air cooled or oil cooled suspension magnet, supporting structure for the discharge belt with drive drum, tail drum and 2 additional idlers where necessary. The drums, idlers are mounted on suitable self aligning bearings. A suitable geared-motor or motor coupled to gear box is used to drive the discharge belt. The discharge belt is a rubber/canvas or rubber/nylon belt with several plies and cleats. For re-tightening the discharge belt, the fixed axle of the tail drum is fitted with a tensioning device. STAR TRACE offers a wide range of standard Electro overband magnetic separators suitable for belt width upto 2500mm and operating heights upto 1100mm.